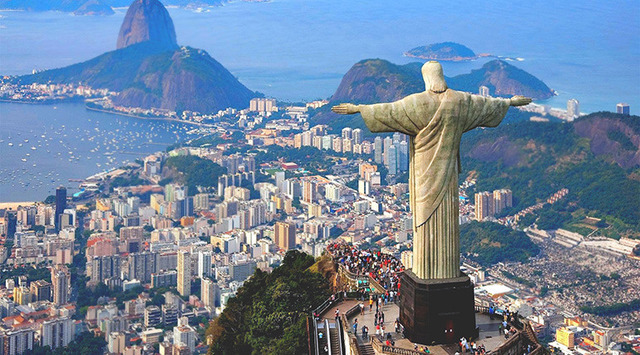 The famous statue Christ the Redeemer overlooks the city of Rio de Janeiro. The statue is a model of Christ with His arms extended so that His body forms the shape of a cross. Brazilian architect Heitor da Silva Costa designed the figure. He imagined that the city’s residents would see it as the first image to emerge from the darkness at dawn. At dusk, he hoped the city dwellers would view the setting sun as a halo behind the statue’s head. During good times and in bad...there is value in keeping our eyes on our Redeemer each day. To be redeemed is to be saved from distress. The Redeemer is the One who saves others from distress; A Messianic title for Jesus. Redemption is salvation accomplished by paying the price for sin. As he suffered, Job said, “I know that my Redeemer lives, and He shall stand at last on the earth”. (Job 19:25). The cry of Job’s heart points us to Jesus—our living Savior who will visit the earth again one day. Keeping our eyes on Jesus means remembering that we have been rescued from our sin. Jesus gave Himself for us, that He might redeem us from every lawless deed and purify for Himself His own special people. Titus 2:14. Anyone who has accepted Jesus as Savior has a reason to be glad today. No matter what we endure on earth, we can have hope today and look forward to enjoying eternity with Him. Insight: Through His death on the cross, burial and resurrection, Jesus has rescued and redeemed us from our sins. Have you ever given God's life changing gift any consideration? If invited, Jesus will come to live within you and change your life now...and for eternity. Dear Jesus, You are my rescuer. Because You died and rose again and put it in my heart to believe on You, I am free from the consequences of my sin forever. I can't say thank You enough...for redeeming my life. In Your Name I pray, Amen. Very good words to go by and follow in everyday life! You just do a very excellent job of showing God's word! If you didn't know it, I am a Christian as well. I try my best to attend my local Christian church every Sunday. So are you a Pastor at your church? , cause as I say again, you do an excellent job of showing God's Word. I didn't know that the CCC had a Fellowship in Christ section until just now, but I am happy that this club does, it just makes this club even better! Well, if you are not a pastor at an actual church, I hope that it is not a problem for me to say that you can be a pastor of the CCC's fellowship section! I guess that's why Wayne gave me the honor of being CCC Chaplain. That's why I'll honor God to do the best job I can, according to His Word.